Following a college career in which he played in the shadow of HB Lydell Mitchell at Penn State, Harris was chosen by the Steelers in the first round (13th overall) of the 1972 NFL draft. It was hoped that he would provide needed depth at running back and he was also valued for his blocking ability. Steelers went 11-3 to finish first in the AFC Central while ranking second in the NFL in rushing yards (2520). Won AFC Divisional playoff over Oakland Raiders (13-7). Lost AFC Championship to Miami Dolphins (21-17). Harris had a lesser year in 1973 due to nagging injuries, rushing for 698 yards and averaging almost two yards less per carry than during his rookie season (3.7). Still, he was again chosen to the Pro Bowl. Harris overcame early injuries in ’74 to rush for 1006 yards and was outstanding in the postseason, in particular with 158 yards in a MVP performance as the Steelers won the Super Bowl over Minnesota. It was the first of six straight thousand-yard seasons and eight overall. He was selected to nine straight Pro Bowls, was a consensus first-team All-NFL selection once, and received at least some All-NFL or All-AFC recognition in five other years. Harris played 12 seasons with the Steelers and finished up in 1984 with a year in Seattle. 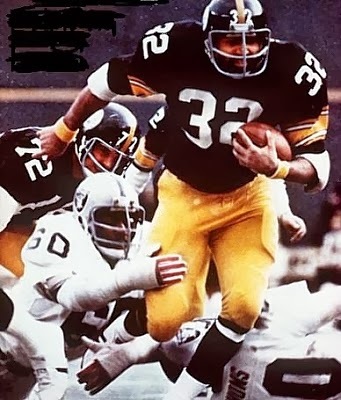 At the time of his retirement, his 12,120 rushing yards ranked third in NFL history (with 11,950 of that coming with Pittsburgh, the most in franchise history). His 100 touchdowns ranked fifth and he added 1556 rushing yards and 17 TDs in playoff games. Harris was inducted into the Pro Football Hall of Fame, Class of 1990.